Justin Cook is the Assistant Professor of Trombone at the University of Central Arkansas where he teaches studio trombone, trombone choir, brass ensembles, and low brass methods. Prior to his appointment at UCA, Mr. Cook was on the faculties of Tarleton State University, Eastfield College and the University of North Texas. He has also been on staff at the Blue Lake Fine Arts Camp in Twin Lake, Michign and is also currently, a member of the brass staff of the Phantom Regiment Drum and Bugle Corps in Rockford, Ill.
Justin Cook holds a Bachelors Degree in Music Ed and Trombone Performance and a Masters Degree in Instrumental Conducting from Northern Arizona University, and is currently completing his Doctoral of Musical Arts degree at the University of North Texas. He has studied conducting with Dr. Daniel Schmidt and Eugene Corporon and trombone with Peter Vivona, David Vining, Jan Kagarice, Dr. Vern Kagarice and Tony Baker. While at the University of North Texas, Justin performed as a member of the internationally acclaimed North Texas Wind Symphony and can be heard on the GIA Windworks series “Teaching Music Through Performance in Band”. During the summer of 2009, Mr. Cook was chosen as one of 18 international tenor trombonists to attend the Alessi Seminar where he had the opportunity to work with Joseph Alessi and Peter Ellefson. Recently, Justin has been featured as a soloist with the Northern Arizona University Wind Symphony, Tarleton State University Wind Ensemble, University of Central Arkansas Symphonic Band and Wind Ensemble. 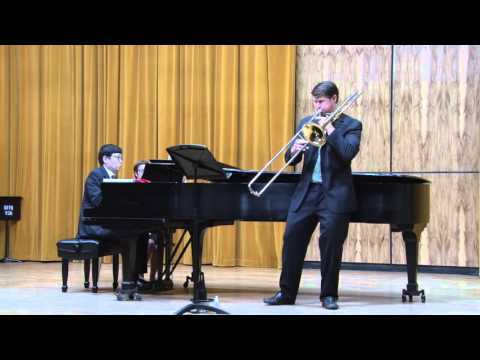 Justin is a member of the Bell Street Four Trombone Quartet, winners of the 2008 ITA Trombone Quartet Competition and featured performer at the Texas Music Educator’s Convention. Mr. Cook was also named Honorable Mention in the International Trombone Association’s Frank E. Smith Solo Competition in 2008. As a freelancer, Mr. Cook has performed with the Abilene Philharmonic, Irving Symphony, Las Colinas Symphony, San Angelo Symphony, Ft. Smith Symphony, Lyric Stage’s Musical Productions at the Irving Arts Center, Dallas Summer Musicals, and The Arkansas Reparatory Theatre. Equally at home as an educator and performer, Mr. Cook had a large and active studio in Flower Mound, Texas. His students have had success in region, area, and all-state bands as well as continuing on at different prestigious universities throughout the country. Mr. Cook was also active with the Flower Mound High School Marching Band where he served as the Brass Caption Head and helped with visual instruction of the band. In Arkansas, Justin is on staff with the Conway High School Marching Band and is active as a marching band and brass clinician throughout the state of Arkansas. Justin is an Edwards Performing Artist and performs exclusively on Edwards Trombones.